While in NYC filming the pilot for my fledgling, burger show, the crew and I happened upon Paul's Da Burger Joint. Fortuitously, this place was already on my list of well-reviewed burger shops in the city, and we just happened to drive by it,.The team at Paul's Da Burger Joint was kind enough to let us shoot some footage there. I found it noteworthy that the place was packed with regulars at 3:00 on a Saturday afternoon. Some of those regulars were even sporting shirts emblazoned with the restaurant's logo. 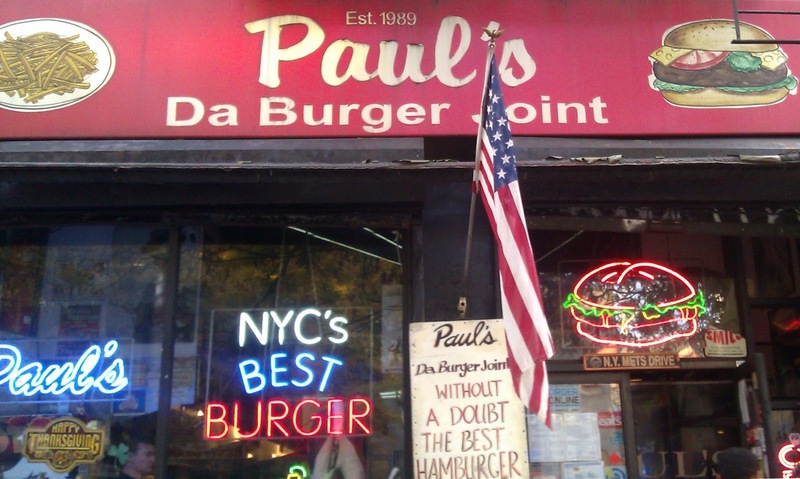 "Paul's "Da Burger Joint" was established in 1989 by its namesake Paul. Originally called "Paul's Palace". It was a family operation run by Paul and his immediate family. To this day, it is run by the same people in the same manner. We can be described as a 50's eatery with counter service, checkered table cloths and vintage decorations. Many people have described us as "their home away from home" because of the friendly cozy environment created by our hospitality and style. Regulars enjoy sitting at the counter, talking with the cooks that they know by name, while eating their big juicy burger and sipping their cold beer. We offer a wide variety of toppings available on any burger including mushrooms, jalapenos, chilly, bacon, etc to name a few. We make shakes, frosteds, egg creams and soda floats. We provide a big portion of high quality food at a reasonable price and do our best to satisfy all customers and make everyone feel at home. We look forward to dining with you over and over." I sat at the counter and ordered a 1/2 pound Cheeseburger for $5.50. I was a little concerned that 1/2 pound of meat for $5.50 was to good to be true. I half expected a bland mess, which was beloved by locals for reasons born more of nostalgia than current quality. I was happily incorrect. The Beef: The blend in the burgers at Paul's Da Burger Joint was bespoke and prepared off-site by their butcher. That same butcher seasoned the blend. The grind was coarse, and this gave the burger a satisfyingly firm and long-grained mouth feel. The mild funk and iron notes led me to conclude that some dry-aged Sirloin made its way into the burgers. The burger also carried a strong beefy flavor even though it was only cooked to the requested Med Rare. The fat content was a mere 15%, but the burgers were extremely juicy. The beef was somewhere between good and great. The Seasoning: I noted a mild dusting of salt on the exterior. Mesquite was added by the butcher during the blending process. 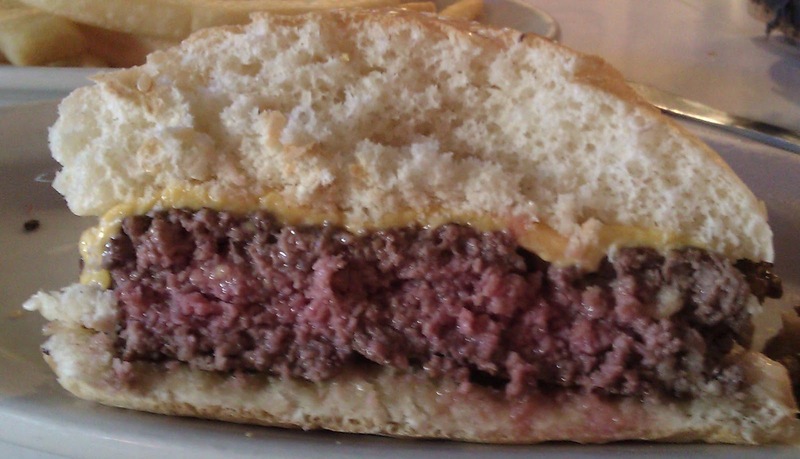 The Sear: The sear on the burger patties at Paul's Da Burger Joint was solid. It was even, dark, and crisp. The griddle was hot enough that the sear did not penetrate deeply enough to compromise the Med Rare cooking request. The Preparation: Did I mention the excellent sear and the perfect cooking temperature? Watching the cooks create the burgers was entertaining. 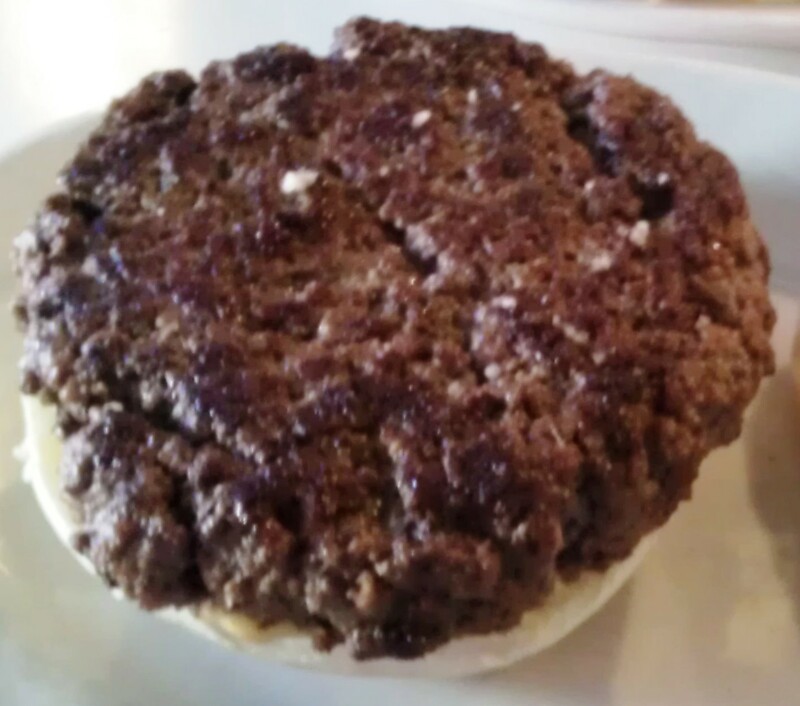 When an order was placed, they grabbed an 8-ounce ball of ground beef and spiked it hard onto the flat top. That was the extent of the shaping, which the patties received. Interestingly, all the burgers that I watched leave the pass were all generally circular. 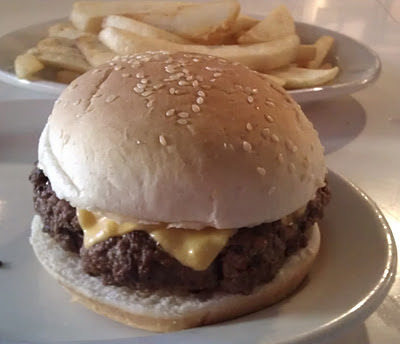 The seared burger patties were finished under metal domes, which served to retain the heat from the gas-fired flat top and cook the thick patties more rapidly than an open cooking method. This was like tenting a turkey to reduce the cooking time. The Cheese: The choices were Cheddar or American. I went with American. Paul's Da Burger Joint applied 2 slices of cheese to its cheeseburgers, so the savory goodness inherent in the American cheese was pronounced and satisfying. The cheese was nicely melted, and it filled in around the coarse beef. 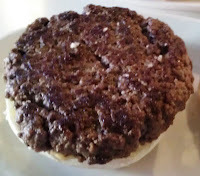 The Bun: The bun was a standard, seeded, lightly toasted, burger bun. It was mildly sweet and a little yeasty. The toasting lent a pleasing crunch around the edges. This toasting complemented the texture of the sear on the beef. The Meat To Bun Ratio: This was just right. The chewy, soft bun captured all of the juices from the burger without adding undue breadiness to the bite. The Fries: The fries were previously frozen, par-cooked, peel-off, steak fries. The fries were crisp on the outside and creamy on the inside. I noted a pleasant earthiness in the thick-cut fries. The seasoning was absent, but this was easily remedied. The Value: I couldn't finish the meal. 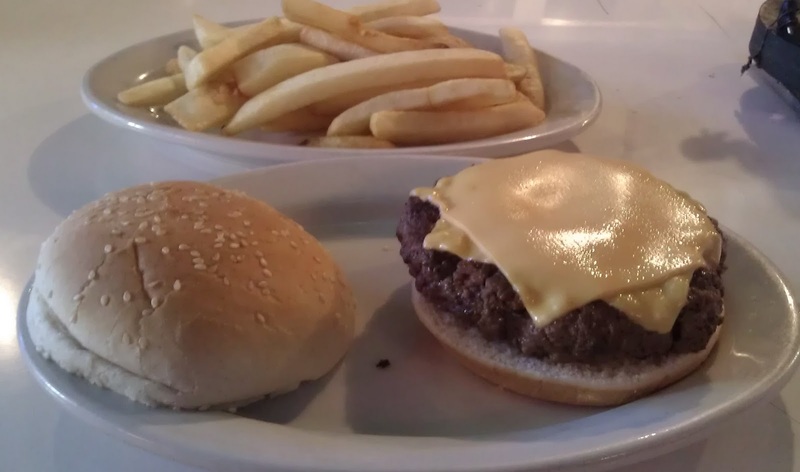 It was $5.50 for a 1/2 pound of steak-heavy cheeseburger with a gang of fries on the side. The value was excellent at Paul's Da Burger Joint. After trying the burger art Paul's Da Burger Joint, I was not surprised at the loyal following they had amassed and retained over the years. The burger was tasty and well-priced. The staff was exceptionally friendly and accommodating. Burger Review : A really, really good burger and an amazing price was enjoyed at Paul's Da Burger Joint.